The Butterfly Nebula is a bipolar planetary nebula located in Scorpius. It lies at a distance of 3,800 light years from Earth. Named for its resemblance to a butterfly, the nebula has a wingspan that stretches across three light years. It is sometimes also called the Bug Nebula. It has the designation NGC 6302 in the New General Catalogue. The Butterfly Nebula has one of the most complex structures ever seen in a planetary nebula. The dying central star is one of the hottest known stars in the galaxy. It has a surface temperature of around 222,204°C (400,000 F) and is hidden from view by dust clouds, but shines brightly in ultraviolet wavelengths. The dust cloud around the star has an estimated temperature of 18,000°C. The gas in the nebula is moving very quickly across space at over 600,000 miles (965,606 kilometres) per hour. The star at the centre of the nebula is a white dwarf with an estimated mass of about 0.64 solar masses. 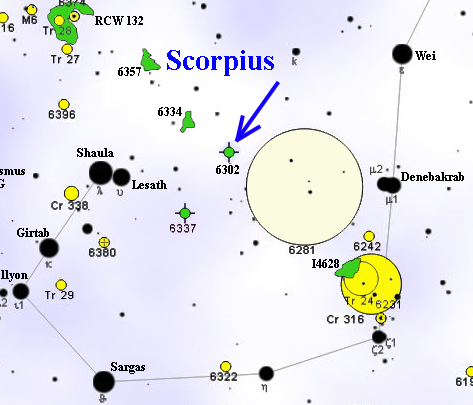 It has a dense disc of dust and gas surrounding it at the equator, which is believed to have caused the star’s outflow of material to form the bipolar butterfly shape, resembling an hour-glass. Planetary nebulae are formed when Sun-like stars in their final stages of life run out of fuel and start shedding off their outer layers and releasing gas at high speeds. Once the central stars begin to heat up, the radiation from the stars causes the clouds of ejected material to glow. The term planetary nebula was first used by William Herschel in the 1780s. The objects got the name because when observed through a telescope their appearance resembled that of a planet. Even though the term is inaccurate and does not really describe these objects properly, it is still used today. The Butterfly Nebula (NGC 6302) is not to be confused with any of the several nebulae which are either similar or referred to by that name: NGC 2346 in Monoceros constellation, the planetary nebula M2-9, also known as Minkowski’s Butterfly or the Twin Jet Nebula, found in Ophiuchus, NGC 6881 in Cygnus, NGC 5189 (Spiral Planetary Nebula) in Musca, Little Dumbbell Nebula (Messier 76) in Perseus, and IC 1318, also known as the Gamma Cygni Nebula, which lies near the centre of the Northern Cross in Cygnus. 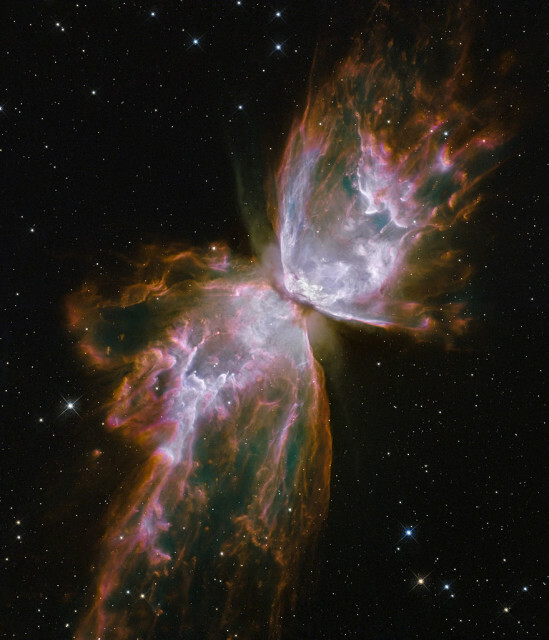 The Butterfly Nebula has been known since at least 1888. The first known study of the object dates from 1907, when the American astronomer Edward Emerson Barnard drew and described the nebula. The Butterfly Nebula has a bipolar structure with two primary lobes and possibly another pair of lobes from an earlier phase of mass loss. The nebula’s central star is obscured by a dark lane that runs through the nebula’s waist. NGC 6302 has a prominent northwestern lobe which is believed to have formed about 1,900 years ago. The central star has not been detected because of the dusty torus obscuring it and absorbing a large amount of the light coming from the nebula’s central region, and because of the star’s bright background. The star has a mass approximately 0.64 times that of the Sun. 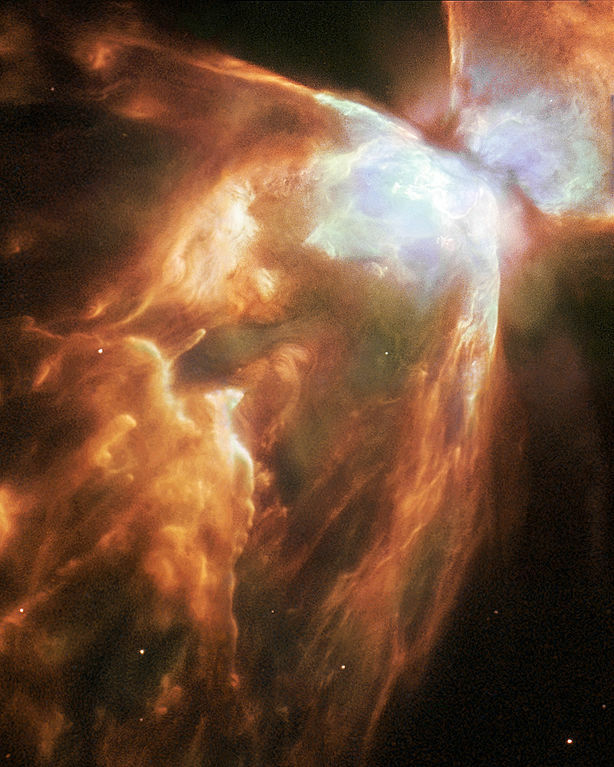 It was originally much more massive, with a mass about five times solar, but ejected most of its mass in the event that resulted in the formation of the nebula. The star is currently evolving into a white dwarf. It is about 34 times as hot as the Sun and one of the hottest known stars. The ultraviolet radiation from the star is making the nebula glow. 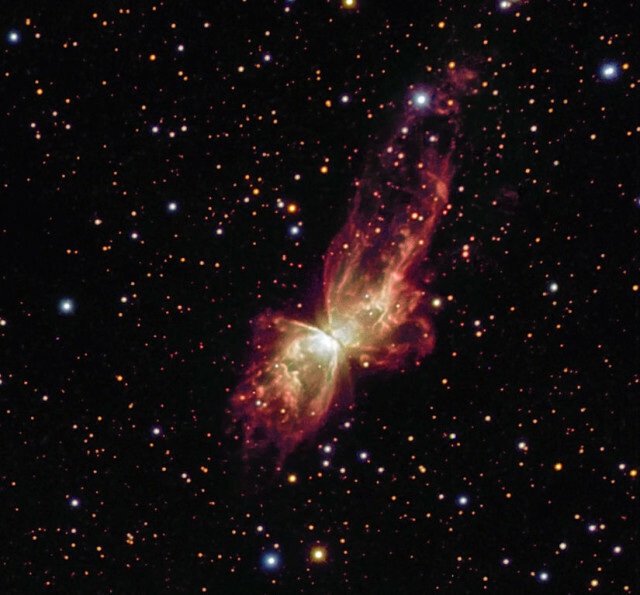 The Butterfly Nebula was one of the bipolar planetary nebulae lying near the galactic core that were discovered to be preferentially aligned to the galactic plane of the Milky Way. The discovery, announced on September 4, 2013, suggests that there is an external force that is shaping their orientation, possibly a strong magnetic field emitted by the galaxy’s bulge. Researchers studied over a hundred planetary nebulae in the central region of the galaxy using the Hubble Space Telescope and European Southern Observatory’s New Technology Telescope (NNT) when they found that the bipolar nebulae were in a surpring alignment with each other, with their long axes aligned along the plane of the Milky Way. The nebulae are in different locations, they have different compositions and histories, and don’t interact with each other, yet they are mysteriously aligned with one another. This is not the case with all planetary nebulae, only the bipolar ones. The shape of planetary nebulae is believed to be determined by the rotation of the central star or star system. The shape of bipolar nebulae is thought to be a result of jets blowing mass outwards from the central star perpendicular to its orbit. While the shape of planetary nebulae is determined by the characteristics of the progenitor stars, the new finding suggests that the central bulge of the Milky Way with its magnetic fields has a stronger influence over the entire galaxy than previously thought.